Happy new year oh faithful blog. And what a way to start the year. Southbound festival was magnificent. And 2 days of caravan park camping before that with my boyfriend and my best friend (and boyfriends brother but he’s pretty ok) were pretty awesome too. Now I’m giving my liver a bit of a rest. I have no new years resolutions because I don’t believe in them. I just fully intend to write more, take more pictures, and get more sunshine. And sunshine was definitely had over new years. Went down to Bunbury which was 2 days of drinking, mini golf, beach, relaxing, almost blowing up a gas bottle, you know the usual things. To cook with we have a gas bottle with a cooker on it. And I hadn’t tightened it enough before I lit it. It really wasn’t my fault, well it was my fault, but I had tightened it as much as I can. I would really like to not be accident prone but I’m not. So I was known as Deb the pyro for the rest of the trip. 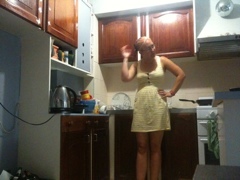 Yeh I may have made a complete fool out of myself over that weekend. But that’s ok – I can live with myself. And now it’s back to real life. Last night was the first time i’ve felt like cooking since I’ve got back. I had been subsisting off a cooked chook I bought on Wednesday for sandwiches (3 days worth of sandwiches in fact, I had another one today) but last night it went in a honey and soy stir fry… and it was good. 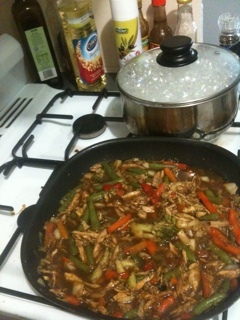 I couldn’t tell you quantities – shredded cooked chook, frozen vegies, honey, soy sauce, wooshter sauce, and chopped basil went into a fry pan and topped it up with some boiling water to make a sauce. 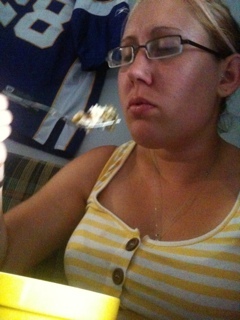 That went over some steamed rice. I’m feeling rather broke after southbound so expect some CD reviews coming up very shortly. And some detailed reports of southbound. 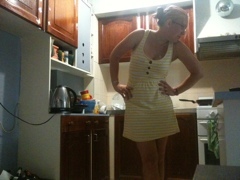 In the meantime here’s some pics of me in my favourite ($5) yellow striped dress, cooking dinner.